Located on the upper reaches of the Yellow River is the northwestern Gansu Province of China. It has a strategic location that made it a very important link between Persia, Greece, and Rome in the West and China in the East. In fact, a large section of the Silk Route passes through the Province. Since ancient times, there has been an equitable exchange of goods and cultures between the Western civilizations and the Chinese kingdoms. This has made the Province a pleasant mix of ethnic groups and religious practices that are most suitable for tourism. Gansu Province is covered by the Qinghai-Tibet, Loess, and the Inner Mongolia Plateaus in different directions. It has the tall Qilian Mountain Range in the south and is relatively flat in the northern districts. The tallest peak in the Qilian Range is Mount Tuanjie at 5,808 meters above sea level. The massive Altyn-Tagh Mountain Range dominates in the west with its tallest peak being at 5,830 meters above sea level. Also, there are three cold deserts in the Province, namely the Gobi, Badain Jaran, and the Tengger. There is an amazing number of 450 rivers flowing through Gansu Province. A large part of the central area is covered by the basins of the Yellow River and the Shiyang River. The lowest elevation in the Province is the Bailongjiang River valley at 550 meters above sea level. Hence, there is not a single area in the Province that is actually at sea level. 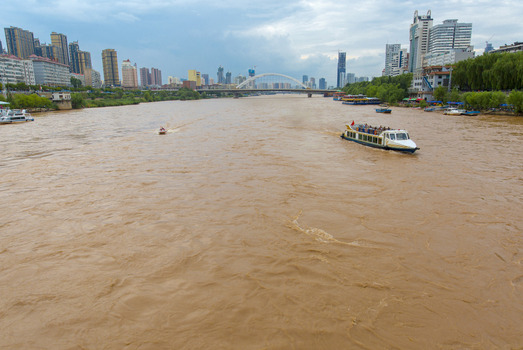 Other significant rivers that flow in the region are the Black River, Tao River, Shule River, and the Jialingjiang River. The climate in Gansu Province also varies with the topography. The desert regions are arid landscapes and have a subarctic climate. The temperatures range between 0oC in summer and -40oC in the winter season. The rest of the Province enjoys a semi-arid continental climate with a large difference in the seasonal temperatures. The precipitation is very less in the Province so the snowfall is experienced only on the high mountain peaks. Spring and autumn seasons are the best times to visit when the temperatures are relatively less extreme. Besides Lanzhou, the provincial capital, the other important cities in Gansu Province include Tianshui, Jinchang, Qingyang, Zhangye, Dingxi, Baiying, Jiayuguan, Pingliang, Jiuquan, and Longnan. There are several county-level cities and minority autonomous counties in the Province that also have grown over the ages. Agriculture is a major occupation of the people. There is a large-scale production of cotton, linseed oil, maize, melons, millet, wheat, and medicinal herbs. The mountains are a rich source of minerals and rare elements like of antimony, chromium, coal, cobalt, copper, fluorite, gypsum, iridium, iron, lead, limestone, mercury, mirabilite, nickel, crude oil, platinum, troilite, tungsten, and zinc among others. The region is also a major producer of crude oil at its fields in Yumen and Changqing. Also, more than 85% of the nickel deposits are located in Gansu. In the last couple of decades, Gansu has evolved into an economically developed province due to large-scale industrialization. Besides mining and refining, the other industries are chemicals, non-ferrous metals, renewable and alternative energy, pharmaceuticals, coal, etc. Tourism and hospitality have also contributed to the prosperity of the Province. Evidence has shown that the Gansu Province had organized human settlements since the Neolithic periods. Archaeological findings have shown that the Dadiwans were a prosperous and civilized society between 6000-3000 B.C. 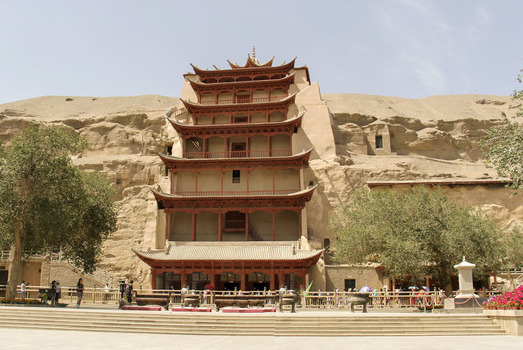 Subsequently, there were many other civilizations that settled and evolved in the region, leaving an indelible mark in the rich history of Gansu Province. The current population of Gansu Province is 26 million. A majority of the people are Han Chinese Buddhists. But there is also a significant percentage of ethnic minority groups like the Hui, Dongxiang, Yugu, Mongols, Hazak, Tibetans, Tu, Baoan, Sala, Manchus, etc. These were at one time migratory people who have remained in Gansu since ancient times and have become a part of the local ethos. Despite modernization in their day-to-day lives, the people have retained their unique folk customs, traditions, and religious practices. The cultural activities in the region have a religious significance. Some of their main festivals are the Labrang Monastery Gathering, Langmusi Monastery Festival, Kongdong Martial Arts Festival, and the Wuwei Tianma Cultural Tourism Festival. The Lanzhou Zhongchuan Airport, Jiayuguan Airport, and Dunhuang Airport provide adequate air transport with nearly 30 domestic and International airlines flying in and out of the Gansu Province. The railway system in Gansu is also very advanced and forms the main connection between the western and eastern provinces of China. 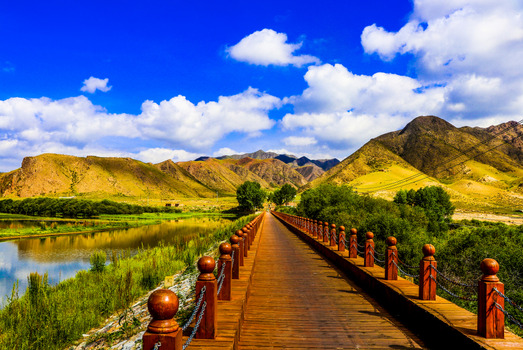 The Zhangye National Geopark (Zhangye Danxia Geopark) has a spectacular landscape. Its 24-million-year old sandstone and mineral deposits have given the tall rock faces a rich kaleidoscope of color. The pillar-like rock formations, deep ravines, rocks of different shapes and sizes, etc. have made it the most visited tourist attraction in Gansu. There are numerous access roads, viewing platforms, and boardwalks to facilitate sightseeing in the area. 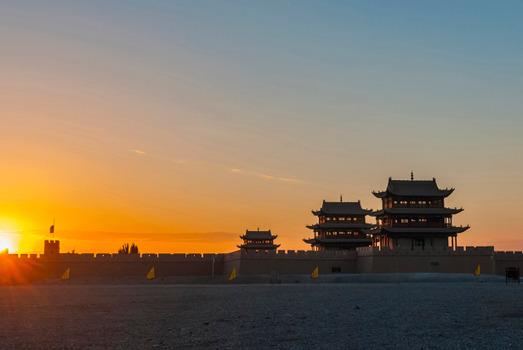 The Mogao Grottoes (UNESCO World Heritage Site), Yueya Spring, Jiayu Pass (Great Wall), Maiji Mountain, Labrang Monastery, Gannan Grasslands, Kongtong Mountain, Three Gorges of the Yellow River, Yellow River Scenic Area in Lanzhou, Dafo Temple (Big Buddha Temple), etc. are some of the other popular tourist attractions. The forests of Gansu Province are also a regular tourist zone. They abound in 659 varieties of wild animals, some of which are on the endangered list. They include the giant panda, golden monkeys, lynx, snow leopards, sika deer, musk deer, and the Bactrian camel. These animals are protected by the state and even photography is not permitted. The cuisine in Gansu Province is mostly of the Han Chinese type with a few Muslim signature dishes. The dish called lamian (or pulled noodles) is a staple of the Han Chinese. The cuisine usually involves braising, roasting, and steaming of either mutton, beef, pork, or chicken. Typical dishes include the Jincheng Baita, Jincheng Babao melon carving, the Baihe Tao, and white leeks cooked with chicken and roasted pork.